Live is life by Opus. I like music. My life would feel empty without music. The only catch is that not all music is likeable. Live is Life is IMHO one of the most hideous songs I’ve had to listen to. So if the song is so unappealing to my musical senses, why am I dedicating this blog post to it? Well…it’s simple. There’s a story behind it. A story in my life which makes it part of my life’s playlist. 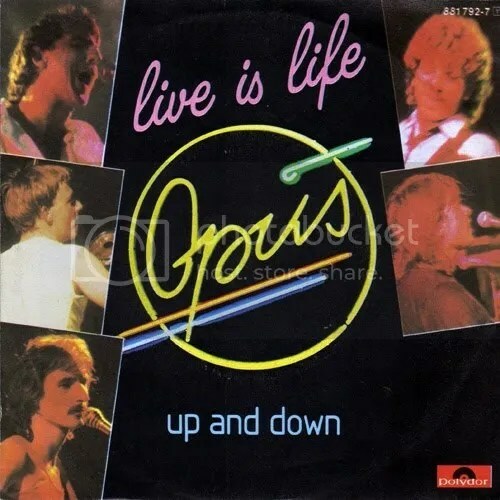 Live is life is a song from the 80’s by an Austrian band called Opus. It’s the band’s second single and if you see the music charts from those days, it was one of the hits of that era. It was digitally remastered in 2011. Anyway, in those days my mom didn’t have a car, so I went to school riding on a bus. Schools here don’t have student transportation, so my parents payed Mr. Arthur to take me to and back from school every day. Mr. Arthur was a chubby friendly faced man, who made a living out of his little bus, and had a pretty good private school bus service. Mr. Arthur was a good driver, we were never late. He was a responsible person most of the time, emphasis on most. Turns out that Mr. Arthur, for reasons beyond my knowledge, didn’t pick us up at school some days. Those days were first sporadic, but then it got to be an everyday thing. Who picked us up? His 18-year old daughter picked us up. I don’t remember her name, as she was a serious girl with us. She never kid around or even talked to us. She was polite, don’t get me wrong, she said hi and bye but that was it. You’d think that if would be hard not to talk to kids while having them in the bus for a whole school year right? Well, she didn’t talk to us because she was too busy listening to her favorite song. Yeah, you guessed it, she was obsessed with Live is life by Opus. She played this song over and over and over and over and over again. I was the last kid on the school bus route. So I had to listen to this song over and over and over and over and over again. And it wouldn’t have been that bad if she listened to the song in a normal volume. Nooooooo, this girl had to pump it up. Now that I think of it, maybe that’s how she managed to keep us all on our seats, because I don’t remember us kids playing or changing our seats! Second grade went by. The last school day came. It was a happy day. The bell rang. I ran outside. Took my seat on the bus and my final ride home for that school year began. One by one, the kids got home and as usual I was the last one on the bus. We were 3 blocks away from my house it hit me, I realized that when I got out of the bus, my summer vacations where officially starting! Yay! So I thought: “School is over, I made it! Live is life!“. And I started singing the chorus of the song, which of course was playing on the bus. All of a sudden, the bus went silent. And I remember it like yesterday. The only sound in that bus was my 2nd grade voice singing “la laaa la la la, live is life“. I froze in panic the second I heard nothing but my voice. I saw that the girl also froze, not in panic but in humorous shock, she grinned at me through the rear view mirror. I don’t know what face I made but she smiled and said: “OK MJ, it’s your last day. Let’s sing it!” She hit play, pumped up the volume and we sang together and out loud the last chorus of Live is Life.